It’s difficult to pinpoint property locations from Colonial warrants and patents. The location of a tract of land is described in reference to another previously established tract of land. In Benjamin (I)’s case, his tract Posey’s Chance, for example, was described in relation to Hornfair and Hopewell, two other tracts that he’d also eventually own. What is immediately clear, though, is that he managed to lease (it was a feudal system so ownership was a fiction really) numerous adjoining tracts from Lord Calvert’s “esquires.” By doing so, he built a profitable plantation of 300+ acres. Looking closely at early warrants for Posey’s Chance and other tracts, the eye wanders to a strange name… “Panquiyah.” William Henson, the author of the warrants, described the tracts as being part of Panquiyah Manor. It’s a strange name. 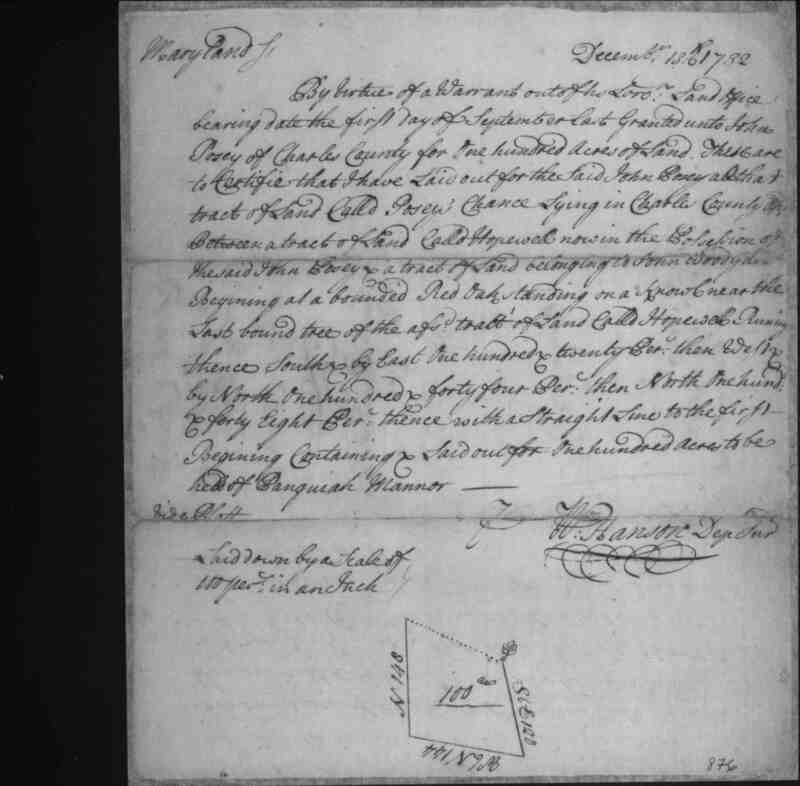 First I thought it was an Indian name, but my searches led me to only one definite reference – a 1765 letter to Governor Sharpe from his Calvert lords describing a vast expanse of acreage that they recommend for immediate lease. They mention a 10,420 acre site called “Pancaya Manor,” next to Beaverdam Manor – absolutely the same place as Panquiyah. Digging a little deeper, I found that “Pancaya” is mentioned in only one other place… in a 1605 book called Don Quixote! It’s not the first time I’ve seen the Colonists mock themselves (Maddox’s Folly is the name of one relative’s plantation), but this goes a step further. Don Quixote explains to his readers on page 249 that he’s been duped… he fell early on in life for a fantasy of literature, and among those fantastical literary descriptions was “balsam of Pancaya” – an impossibile poetic promise, like gold from Tiber and pearls from the South Sea. Or a Colony of milk and honey.